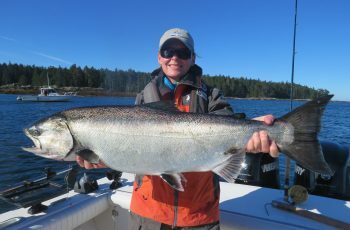 As promised, a TYEE REPORT from the Clubhouse, yes we broke the ice, FOUR TYEE on the day, top fish 41 lbs…released! I had a feeling we would bust out this trip, bait moving in, tides and winds working in our favour. 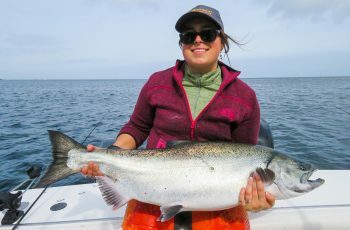 The rougher it is the better when limiting boat traffic, and those who pounded out west and took a small beating were rewarded with some fish. Northwest 25 with a heavy tide is the ticket to some room in one of my favourite spots, sure it was bouncy, but chinook were in the area and providing some action. 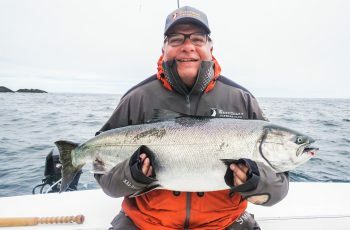 Top Fish was taken by David Boyer, a 41 lber, largest fish at Langara this season thus far, and a fish he was thoughtful enough to put back after some great pics. his partner David Akins had a 31, wow, nice fish there too. Brent Saharchuk tagged a 33.5 and David Stevens released a 31 , out at Andrews this pm with Buckshot, David traveling from England I am told. The hot boat for size was Brent’s, but most of our guides found some fish. A nice low twenties was tagged at the reef in Bryce’s boat, a couple higher twenties in Ryan’s boat. 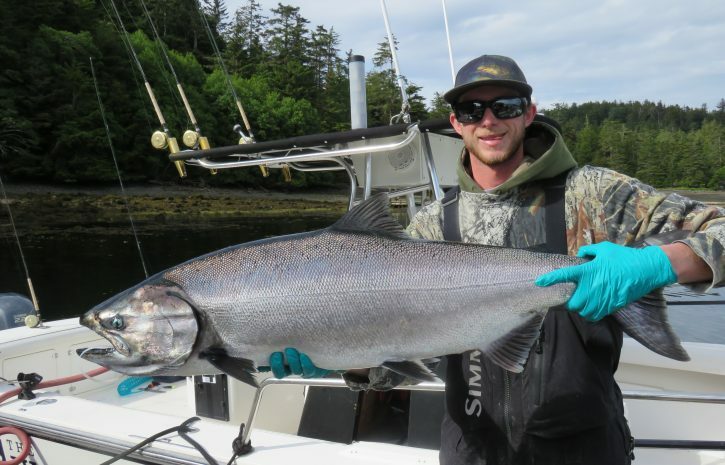 Kory had a few nice sea lions, but tagged a fish in the twenties and certainly was busy. I fished out west and battled the wind and waves with several of our guides. 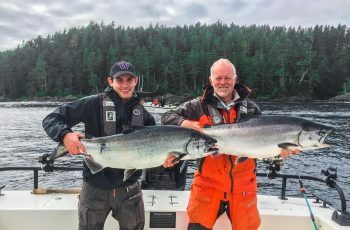 We grabbed our first double of the year, and what a cluster you know what ensued…I had two fish tangled in three motors, around both riggers, wrapped in the cannon balls, around a third rod, under the boat, at one point around my neck, but we persevered, no one lost an eye, and managed to land both high teeners. What a mess, every second wave over the stern, all engines up, several guides guffawing! We ended up with our limit of springs, our boat topped out at 21 lbs, but plenty of action. In general the east side is hit and miss, lions stacked up like cordwood at times, but the water was nice I hear, and traffic heavy. For those that could take the beating, although once fishing we were dry and safe in our big whalers, the fishing was decent. At dinner the scuttlebutt with the guides was that a couple fish a boat was the average, some not catching but most getting chances, with some losing epic battles with the rock dogs. Certainly we are on the upswing as predicted, and check back again soon for tomorrows report. Hmm. We all know this is not a rare occurence of 3 way…tangle 🙂 off the back of Screams boat. Good luck on the quest for the 70+ released. 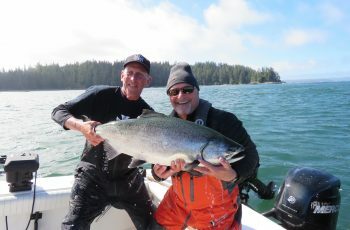 another 40 this pm, slower today, 22 chinook on the dock, 40 was released!